The boutique business is booming with customer attraction towards designer dresses increasing and purchasing power rising. Nepali customers have become more brand and fashion conscious due to which demand for designer wear has swelled. Swornika’s, Crossroad Apparel, Sarthak Fashion Boutique and Oodni are some of the popular boutiques offering stylish clothes for women. Swornika’s Boutique launched nearly a year ago. Rojina Bajracharya and Ganga Dawadi, both graduates in fashion design, joined forces and opened the store where they sell lehengas, sarees and gowns which they design themselves besides made-to-order clothing. “The changing concept of Nepali customers towards fashion and style has boosted the business,” said Dawadi, proprietor of the boutique. The boutique has designer dresses with prices ranging from Rs12,000 to Rs40,000. Likewise, bridal lehenga prices range from Rs62,000 to Rs80,000. It takes more than 10 days to make the dress, she said. According to her, social media has made it easier to do business as they can make direct contact with exporters and place orders for fabrics and accessories to design the dress. 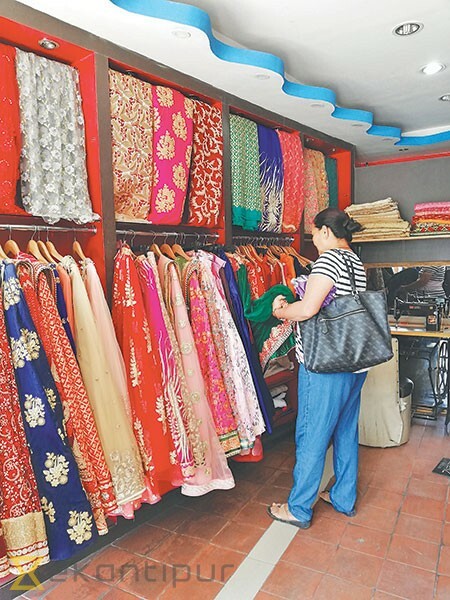 With Teej, the greatest festival of Hindu women approaching, and the current month Shrawan being a special month for Hindu women, boutiques in Kathmandu are introducing trendy designs to attract customers. Kupondol, a popular hub for boutiques, now hosts more than 55 stores. Crossroad Apparel, established in 2008, offers stylish clothes for all ages. The boutique business is on a rising trend, said Ashrita Bhadel, CEO of Crossroad Apparel. The boutique uses domestic and international fabrics and accessories to make its products. The store uses Nepali dhaka and cotton and imports other fabrics from India, China, Japan and Korea, she said. Likewise, Sita Bhattarai, managing director of Sarthak Fashion Boutique who has been in the business for 15 years, said there had been remarkable growth of late. She maintains two branches in the Capital and plans to open a few more in the future. The boutique offers designer gowns costing Rs5,000 to Rs35,000 and bridal lehengas costing Rs8,000 to Rs150,000. The boutique has a staff of 15. According to her, monthly sales go up to around Rs900,000 during the wedding season. Oodni offers designer dresses with price tags ranging from Rs7,000 to Rs40,000, said Saraswoti Katuwal, a sales girl at the boutique. “During the off-season, our monthly turnover amounts to Rs300,000,” said the boutique owner. Business increases by double digits during the wedding and festive seasons.